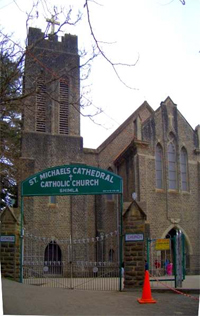 St Michaels Cathedral in Shimla is a throwback to the Victorian era, dating back to 1886. The interiors of the cathedral are decorated in typical French- Gothic style architecture. Currently, the cathedral can hold a service of at least 400 people. Like other churches in India, St. Michael's Cathedral incorporates a nave, a vestry, a confessional room, a baptistery room and two aisles. Organ in the church is considered to be the finest in North India. St. Michael's Cathedral was once acknowledged as the 'Ripon Place' because the building was in a construction process when Lord Ripon (1880-1884) was the Viceroy of India. 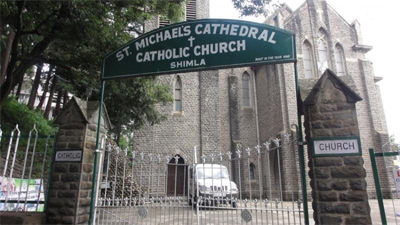 It was the first Roman-Catholic church to be built in the hill station and was designed under the guidance of Henry Irwin, the then Superintendent Engineer and Architect of PWD in Shimla. All thanks to its beauty, grandeur and mirror work, the church is a great sight to look at; moreover, it attracts devotees from all over India. 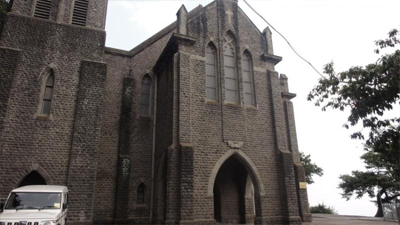 The big church building is an important landmark of Shimla and located just below the district court. There is an aroma of spirituality in the air of St. Michael's Cathedral, which sways tourist to light a candle here or lay some flowers amongst the gilded walls. Inside the church, tourist can catch sight of old glass tapestry and a precious old statue of "Our Lady of Guadalupe," which is a gift from Mexico. The beautiful architectural masterpiece is worth a visit on a trip to Shimla.